That’s right, I’m jumping right from heavenly cupcakes, to healthful veggies. It has been far too long since I posted a salad here. Like, 5 months too long. Actually, I’ve only ever posted one measly salad on this site (a dandy, though… my fall favorite, Warm Smoky-Maple Kale Salad with Apples and Sweet Potatoes). Well, that needs to change. Smoky-Maple Kale needs a friend to chill with on the Recipe page‘s salad category. Now that the weather is finally warming up, bright, crunchy, fresh, and zesty salads are starting to sound very tasty. Sometimes I forget how good a nicely planned salad can be. Not my usual handful-of-spinach-and-random-veggies thrown haphazardly on a plate and splashed with oil and vinegar, but a well thought-out and carefully prepared fusion of textures and flavors. 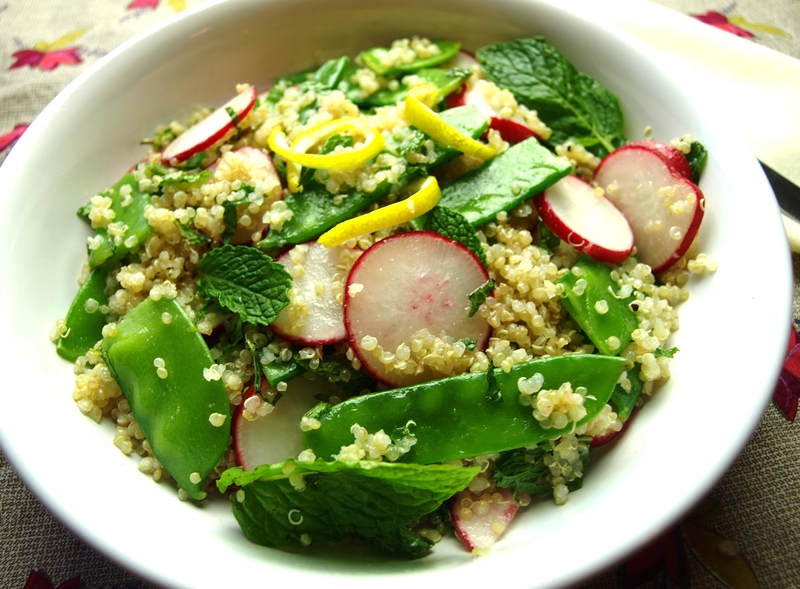 I just love the peppery radishes combined with the cool mint, crunchy peas, and zingy lemon dressing. 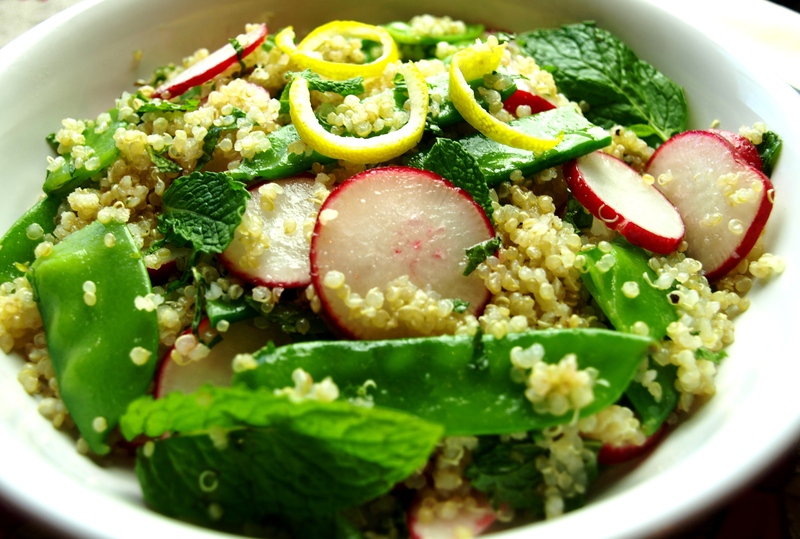 The quinoa provides a great canvas for all these splashy flavors, and makes the salad a bit more filling. I was inspired to make this salad by this lovely red bunch of radishes. They were practically screaming “Look at me! Hey, hey… I know you can see me! Helloooo” Gorgeous, right? And since I’m already stuck on mint and lemon at the moment, those of course had to be invited to the salad party too. Something was missing though. It needed more green, and more crunchy. 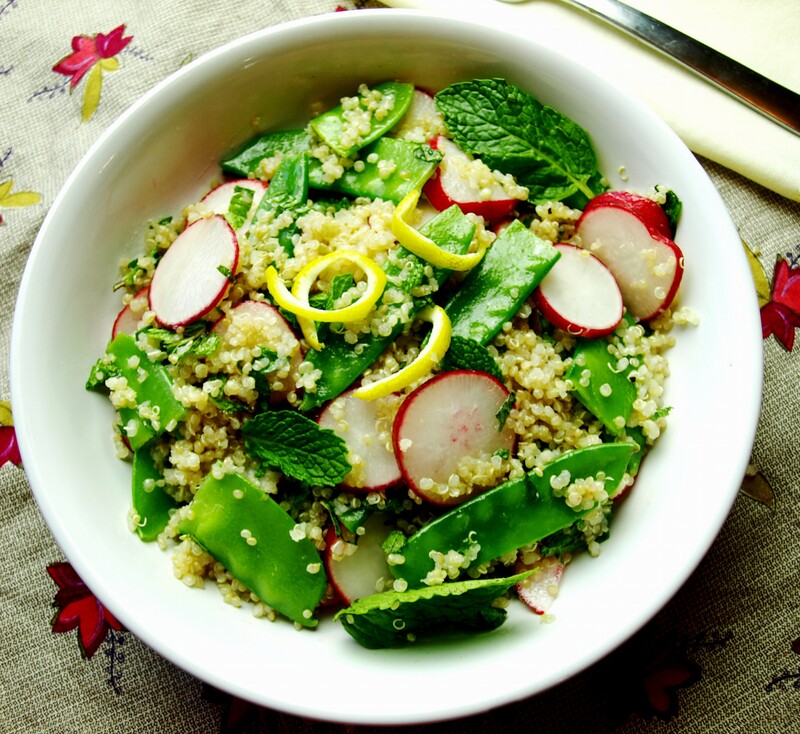 Because this salad is a celebration of spring, peas seemed to be just what I was looking for. I’m thrilled with the results of this little spring vegetable soiree, and even more excited about the beauty and health benefits of this multihued medley. Pretty lady salad, detox salad, love your liver salad, gorgeous skin salad… I had so many ideas for what to call this beautifying dish. Check out these impressive ingredients, and you’ll see why you need this salad in your life. Radishes – These crisp, sometimes pungent, root vegetables are a relative of kale, broccoli, and cabbage. Just like it’s cousins, radishes have numerous health benefits. These include lowering cholesterol, preventing cancer, relieving asthma symptoms, and regulating blood pressure and blood sugar levels. They are a good source of vitamin C, an important antioxidant in fighting diseases, as well as free radical damage that can lead to visible signs of aging. One of the most notable benefits of radishes is their ability to purify the blood and support liver and kidney health. If healthy skin is on your wish list, then getting your liver in tip top shape should be a priority. Radishes stimulate bile production, which in turn helps to keep your gallbladder and liver running smoothly. It also helps regulate bilirubin (the brownish-yellow substance found in bile that is produced when the liver breaks down old red blood cells) and clear out the excess from your blood. Furthermore, they’re full of fiber, which also helps to flush toxins and prevent constipation. Radishes can even lead to better nutrient absorption, due to their ability to dissolve mucus in the digestive tract. Want to do a little spring cleaning for your body? Reach for the radishes! Peas – I used snow peas, but snap peas, or even green peas would be delicious here. You’ve heard me braggin’ on the pea before, back in my green pea pesto post. I’ve got only good things to say about this leguminous veggie. This quintessential spring vegetable is full of antioxidants and anti-inflammatory compounds, is helpful for blood sugar regulation, and is even a reliable source of ALA omega-3’s. Like any food that is good for your overall health, peas provide benefits for your skin and hair as well, by fighting free radicals (think: youthful glow) and inflammation (think: calmer, clearer skin). Lemons – Another cleansing food, lemons can further help support liver and bowel health, and encourage regularity and waste elimination. 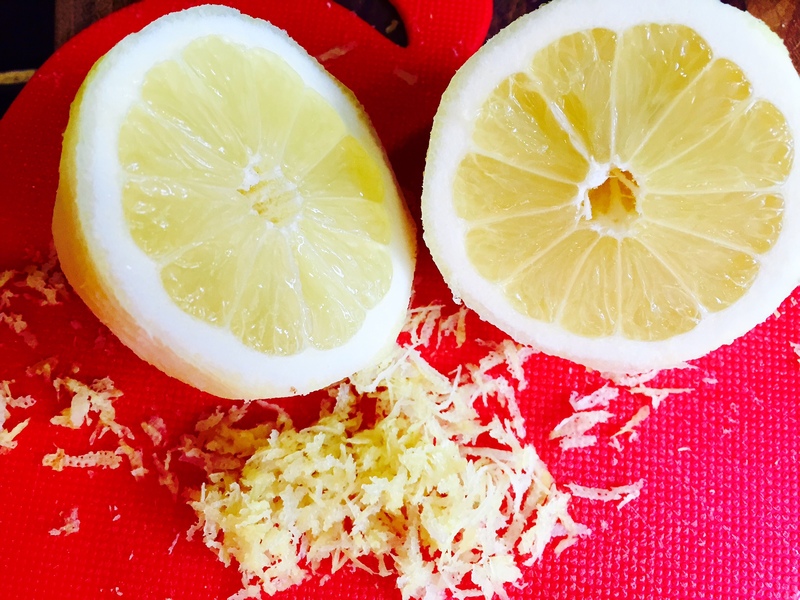 Although acidic, within the body lemons are alkaline-forming, helping to restore pH balance. Balancing your pH levels is thought to help prevent colds and diseases, increase energy improve dental health, slow down aging, and promote clear skin. 1. Prepare your quinoa (about 1 cup uncooked) according to package directions, then allow to cool (I put mine in the fridge while preparing the rest of the salad). 2. Boil a pot of water and add your fresh snap or snow peas (or frozen petites) allowing them to cook only for a couple of minutes. They should turn bright green. Remove from heat and rinse with cold water in a colander. 3. Prepare the dressing. Simply add all ingredients to a jar, cover with a lid and shake, shake, shake. Adjust ingredients to taste. 4. 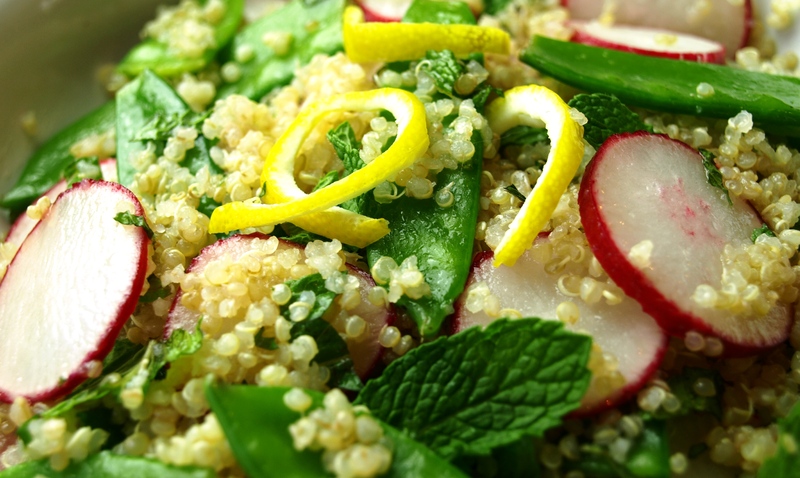 Add quinoa, sliced radishes, peas, and mint to a large bowl and gently toss together. If you’re planning to save some salad for later, dish out your serving and add the dressing to it, then store the dressing and salad separately in the fridge. If you’re serving this to guests, add the dressing to your salad serving bowl and toss to combine. Serve with a little extra salt and pepper sprinkled on top and garnish with mint and lemon zest. For extra lemon flavor, add a 1/2 teaspoon of lemon zest to your dressing. If you love mint, go with the full 1/2 cup of minced mint. I used about a 1/3 cup plus an extra heaping tablespoon. Gorgeous salad! I love all those ingredients! We just are our first batch if radishes from our garden and the next batch is almost ready to pick, I might just have to make this salad with them! Oh that’s wonderful! Fresh garden radishes! I think I’m going to have to plant some this year. I mostly grow things in pots (not much space for a garden) but I think it’d work! Hope you give the salad a try! They are SO easy to grow! I think you will be successful growing them indoors in player boxes.